South African soldiers in uniform. The South African National Defence Force (SANDF) has cautioned that wearing a SANDF uniform when you are not a member is a punishable offence. This comes after an EFF student was interviewed wearing SANDF camouflage. The SANDF in a statement said that a young man who was interviewed on etv news on 21 January at the University of the Western Cape (UWC), wearing a SANDF camouflage shirt and the EFF beret, is not a SANDF member. 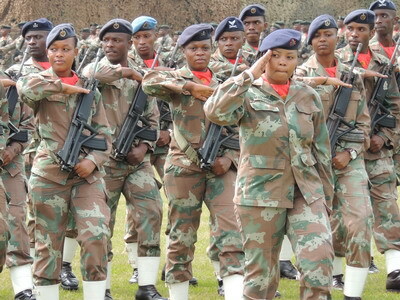 “The SANDF further reiterates that, wearing the SANDF uniform when you are not a SANDF member is a punishable offense and anyone who is caught committing this illegal act will be prosecuted,” Siphiwe Dlamini, Department of Defence Head of Communication said in a statement.